An association exists between anomalous pancreaticobiliary junction (APBJ) and choledochal cysts, cholangiocarcinoma, and carcinoma of the gallbladder. The potential exists for imaging modalities to miss small cancers of the bile ducts and gallbladder; however, definitive surgery should be planned in all patients and should include resection of incidental lesions. Type IV (A) choledochal cyst. 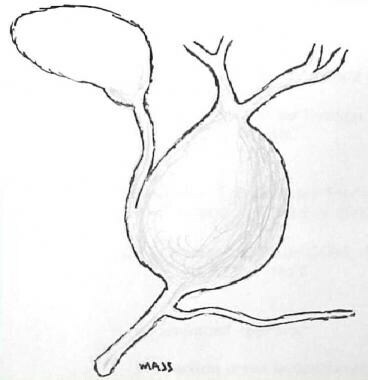 Type V choledochal cyst (Caroli disease). According to Miyano and Yamataka, the preferred initial radiologic examination in the diagnostic workup of a choledochal cyst is an abdominal US scan. US scanning is noninvasive and involves no radiation exposure, and its findings are sensitive and specific for the diagnosis. Clinically, these features make sense. Patients with choledochal cysts most often have symptoms referable to the hepatobiliary system, and most US operators are familiar with the anatomy of this area. Once a preliminary diagnosis is made using US scanning, other supportive studies may be ordered, including abdominal CT scans, MRI studies, or MRCP examinations. [10, 11, 12] These studies demonstrate the cyst with more precise anatomic detail. In addition, important anatomic relationships to surrounding structures are better defined than with other modalities. US scanning is an excellent choice for initial imaging, but it does have limitations, including the fact that its effectiveness is dependent on operator experience, that cysts on US images may be misinterpreted as the gallbladder or other structures, and that US scanning suffers decreased sensitivity in the presence of overlying bowel gas, pancreatitis, cholangitis, or other inflammatory processes. Differentiating a choledochal cyst from a hepatic cyst, hepatic abscess, acute fluid collection, or pancreatic pseudocyst may be difficult. For patient education information, see the Liver, Gallbladder, and Pancreas Center, as well as Gallstones. Plain abdominal radiographs are of little use in the diagnosis of choledochal cysts. They offer no specific information related to this diagnosis. In patients presenting with abdominal pain, radiographs are frequently ordered as part of the standard workup. At most, radiographs may suggest displacement of an adjacent hollow viscus, such as the duodenum, by a mass. False-positive and false-negative rates are high if the diagnosis is based on plain abdominal radiographs. 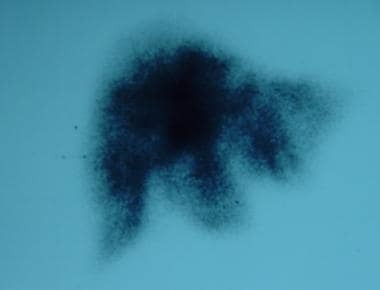 Plain radiographs cannot depict choledochal cysts well. 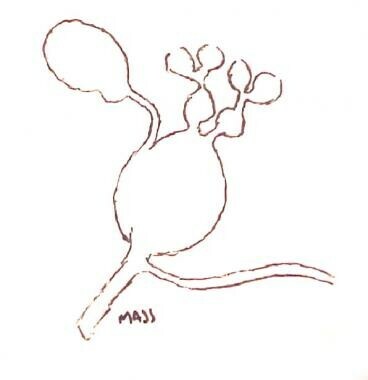 Many other masses or inflammatory processes can produce the same clinical picture, which cannot be differentiated by using plain images. Examples of these processes include an acute fluid collection associated with acute pancreatitis, a pancreatic pseudocyst, and choledocholithiasis or cholangitis. Abdominal CT scanning is useful in the diagnostic algorithm for choledochal cysts (see the images below). CT scanning is highly accurate and offers a great deal of information that is helpful not only in confirming the diagnosis, but also in planning surgical approaches. Computed tomography scan demonstrates a choledochal cyst involving the intrahepatic portion of the common hepatic duct and the main left hepatic duct. Choledochal cyst involving the intrahepatic common hepatic duct. Large, saccular, type I choledochal cyst compressing the adjacent gallbladder. Large type I choledochal cyst and adjacent gallbladder. Computed tomography (CT) CT scan demonstrates the proximity of the duodenum to the distal aspect of a choledochal cyst. CT scans of a choledochal cyst demonstrate a dilatated cystic mass with clearly defined walls that is separate from the gallbladder. 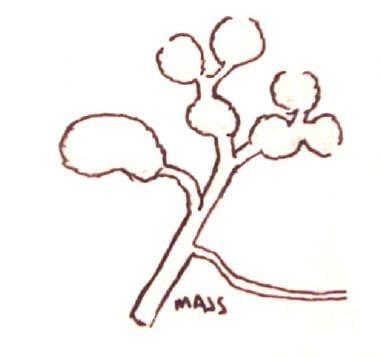 The fact that this mass arises from or actually is the extrahepatic bile duct usually is clear from its location and its relationships to surrounding structures. The cyst is typically filled with bile, which produces waterlike attenuation. Depending on the patient's age and clinical history, the wall of the cyst can appear thickened, especially if multiple episodes of inflammation and cholangitis have occurred. 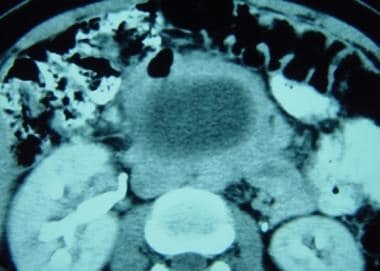 Most patients with choledochal cysts have undergone abdominal US imaging prior to CT scanning. US findings suggest the diagnosis in most patients and may be conclusive in many. According to Lipsett and colleagues, CT scanning confirms an unclear diagnosis and provides information concerning the relationships of the cyst to surrounding structures. These include the portal vein, duodenum, and liver. In addition, CT scanning is superior to US scanning in defining the extent of the cyst in the extrahepatic biliary system and in detecting intrahepatic disease. CT cholangiography is one of the CT imaging techniques that has been used in the diagnosis of choledochal cysts. 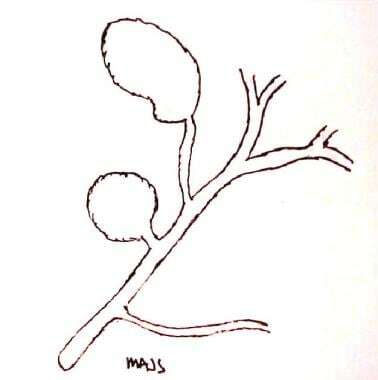 Satisfactory visualization of the biliary tree was achieved in 93% of patients by using CT cholangiography and in 100% of patients by using MR cholangiography. CT cholangiography adequately depicted 10 (91%) of 11 choledochal cysts, whereas MR cholangiography showed 100% of the cysts. Intrahepatic stones were detected, with sensitivities of 83% and 67% for CT scanning and MR cholangiography, respectively. Specificities were 100% for both. CT cholangiography demonstrated the pancreatic duct and the common pancreatobiliary channel in 64% of patients, whereas MR cholangiography depicted these features in 46%. 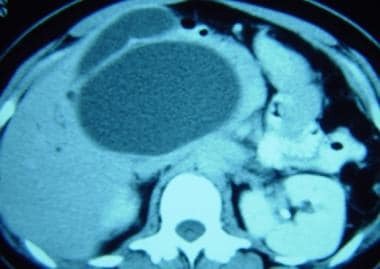 Postoperatively, CT cholangiography was better for surveillance of the hepaticojejunostomy. The authors recommended the use of MR cholangiography as the confirmatory imaging study in children with choledochal cysts because it does not require breath holding, is noninvasive, does not require the administration of contrast material, and is not associated with ionizing radiation. CT scans can be relied on with a high degree of confidence. False-positive and false-negative results in CT scanning are rare. They provide a great deal of information concerning choledochal cysts and their relationships to surrounding structures. 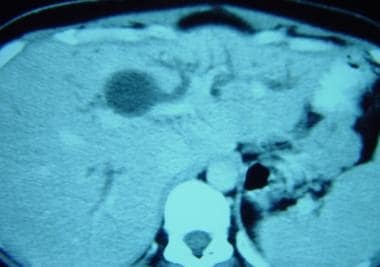 Typically, the only preoperative study that may be considered after a confirmatory CT scan is ERCP. ERCP often provides additional information concerning the pancreatic duct and the distal extent of the choledochal cyst. ERCP can provide more detailed information concerning the epithelium of the cyst and detect the presence of associated tumors or strictures. Irie and associates concluded in a study that MRCP is an important noninvasive diagnostic study for choledochal cysts but that it should not replace ERCP, especially in children. The authors used MRCP in the diagnosis of choledochal cysts in 16 patients. They found that MRCP defined the proximal bile duct better than ERCP but that defects in the distal common bile duct were missed with MRCP in 2 pediatric patients. The anomalous pancreaticobiliary junction (APBJ) was delineated in all 6 adult patients but was missed in 6 of 10 pediatric patients. Kim et al concluded that MR cholangiography is equivalent or superior to conventional cholangiography in the evaluation of choledochal cysts. The authors compared MR cholangiography with conventional cholangiography in 13 patients with choledochal cysts. 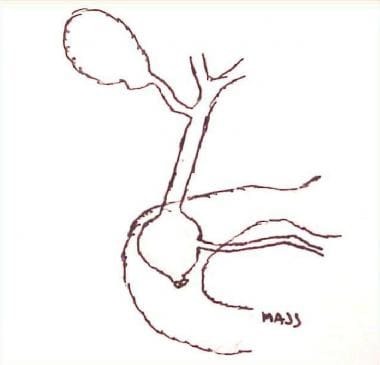 MR cholangiography was superior for complete imaging of the cyst. Detection rates for the APBJ and bile duct stones were not significantly different. On the basis of reported results, MRCP appears to be a reliable study in the diagnosis of choledochal cysts, with diagnostic accuracy of 82-100%. In preparation for surgery, particularly when information is needed concerning the location of the APBJ and the length of the common channel, another study, such as ERCP, should be performed. Differentiating a choledochal cyst from a pancreatic pseudocyst or other cystic lesions of the pancreas may be difficult using MRI findings. No normal anatomic variants mimic a choledochal cyst. However, false-negative findings of the absence of the APBJ and the common pancreatobiliary channel are possible. 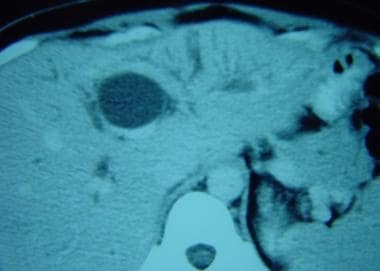 In addition, small neoplasms of the gallbladder and bile duct may be missed. A diagnostic sonogram is shown in the image below. 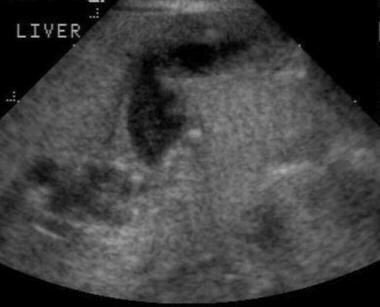 Diagnostic sonogram demonstrating a type I choledochal cyst in a 4-month-old child presenting with elevated hyperbilirubinemia and hepatic transaminase levels. US scan findings are diagnostic in many patients; however, in the preoperative period, complementary studies, such as ERCP, CT scans, or MRI/MRCP, may be helpful in delineating details of the surrounding anatomy, the location of an APBJ, and the length of the common pancreatobiliary channel. Abdominal US scan findings can help in detecting conditions associated with and complications of choledochal cysts, such as choledocholithiasis, intrahepatic biliary dilatation, portal vein thrombosis, gallbladder or biliary neoplasms, pancreatitis, and hepatic abscesses. US scanning is sensitive in the demonstration of a cystic lesion in the region of the porta hepatis. If such a lesion is visualized, US scanning frequently may provide enough information to make the diagnosis of a choledochal cyst. No actual normal variants are mimetic of choledochal cysts. Pathologic conditions in the differential diagnosis include pancreatic pseudocysts, hepatic cysts, and biliary atresia with associated cystic masses. At times, differentiating these lesions may be difficult using US scan findings. In this situation, other confirmatory tests are definitely indicated. Hepatobiliary scintigraphic modalities are used commonly in the setting of acute cholecystitis and in the investigation of neonatal jaundice. In addition, these techniques are useful in the diagnosis of choledochal cysts (see the images below). Nuclear medicine scan of a choledochal cyst. 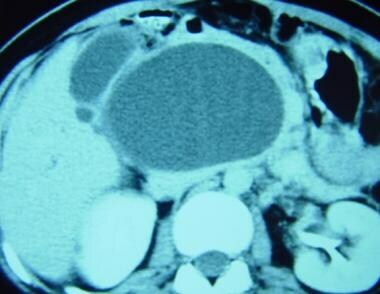 Early image shows most of the radionuclide in the liver. Nuclear medicine scan of a choledochal cyst midway through the study, with better filling of the cyst by the radionuclide (see the previous image). Nuclear medicine scan of a choledochal cyst late in the study, with the cyst completely defined (see the previous 2 images). Hepatobiliary scintigraphy has been shown to correlate with ERCP or surgical diagnosis in 86% of patients. In one study, all 12 type I cysts were diagnosed correctly using hepatobiliary scintigraphy. The sensitivity for the diagnosis and classification of type IV cysts was 67% (6 of 9 cases). The difficulty was the relative inability to diagnose intrahepatic disease in type IV cysts. 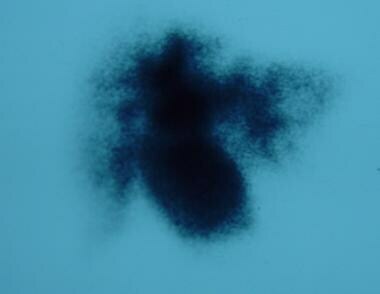 Hepatobiliary scintigraphy has reasonably good accuracy in the diagnosis of choledochal cysts. However, it probably should not be relied on as the sole study and should be complemented by ERCP, CT scanning, or MRCP. No known normal anatomic variants mimic this disease process. However, false-negative results can derive from the relative inability to diagnose intrahepatic disease in type IV choledochal cysts. Soares KC, Goldstein SD, Ghaseb MA, Kamel I, Hackam DJ, Pawlik TM. Pediatric choledochal cysts: diagnosis and current management. Pediatr Surg Int. 2017 Jun. 33 (6):637-650. [Medline]. [Full Text]. Saito T, Terui K, Mitsunaga T, Nakata M, Yoshida H. Significance of imaging modalities for preoperative evaluation of the pancreaticobiliary system in surgery for pediatric choledochal cyst. J Hepatobiliary Pancreat Sci. 2016 Jun. 23 (6):347-52. [Medline]. [Full Text]. Alonso-Lej F, Rever WB, Pessagno DJ. Congenital choledochal cyst, with a report of 2, and an analysis of 94, cases. Int Abstr Surg. 1959 Jan. 108(1):1-30. [Medline]. Todani T, Watanabe Y, Narusue M, et al. Congenital bile duct cysts: classification, operative procedures, and review of thirty-seven cases including cancer arising from choledochal cyst. Am J Surg. 1977 Aug. 134(2):263-9. [Medline]. Rajnish A, Gambhir S, Das BK, et al. Classifying choledochal cysts using hepatobiliary scintigraphy. Clin Nucl Med. 2000 Dec. 25(12):996-9. [Medline]. Soares KC, Kim Y, Spolverato G, Maithel S, Bauer TW, Marques H, et al. Presentation and Clinical Outcomes of Choledochal Cysts in Children and Adults: A Multi-institutional Analysis. JAMA Surg. 2015 Jun 1. 150 (6):577-84. [Medline]. Lewis VA, Adam SZ, Nikolaidis P, Wood C, Wu JG, Yaghmai V, et al. Imaging of choledochal cysts. Abdom Imaging. 2015 Aug. 40 (6):1567-80. [Medline]. Huang SG, Guo WL, Wang J, Sheng M, Lan XH, Fang L. Factors Interfering with Delineation on MRCP of Pancreaticobiliary Maljunction in Paediatric Patients. PLoS One. 2016. 11 (4):e0154178. [Medline]. [Full Text]. Sacher VY, Davis JS, Sleeman D, Casillas J. Role of magnetic resonance cholangiopancreatography in diagnosing choledochal cysts: Case series and review. World J Radiol. 2013 Aug 28. 5(8):304-12. [Medline]. [Full Text]. Tsuchida A, Nagakawa Y, Kasuya K, Kyo B, Ikeda T, Suzuki Y, et al. Computed tomography virtual endoscopy with angiographic imaging for the treatment of type IV-A choledochal cyst. World J Gastroenterol. 2012 Jul 28. 18(28):3761-4. [Medline]. [Full Text]. Sallahu F, Hasani A, Limani D, Shabani S, Beka F, Zatriqi S, et al. Choledochal cyst - presentation and treatment in an adult. Acta Inform Med. 2013. 21(2):138-9. [Medline]. [Full Text]. Eliscu EH, Weiss GM. Hematobilia due to a pseudoaneurysm complicating a choledochal cyst. AJR Am J Roentgenol. 1988 Oct. 151(4):783-4. [Medline]. Kirimlioglu V, Yilmaz S, Katz DA, et al. Choledochal cyst spontaneously rupturing the hepatic artery. Dig Dis Sci. 2000 Mar. 45(3):544-8. [Medline]. Lipsett PA, Pitt HA, Colombani PM, Boitnott JK, Cameron JL. Choledochal cyst disease. A changing pattern of presentation. Ann Surg. 1994 Nov. 220(5):644-52. [Medline]. [Full Text]. Lam WW, Lam TP, Saing H, et al. MR cholangiography and CT cholangiography of pediatric patients with choledochal cysts. AJR Am J Roentgenol. 1999 Aug. 173(2):401-5. [Medline]. Oto A, Ernst R, Ghulmiyyah L, Hughes D, Saade G, Chaljub G. The role of MR cholangiopancreatography in the evaluation of pregnant patients with acute pancreaticobiliary disease. Br J Radiol. 2009 Apr. 82(976):279-85. [Medline]. Chavhan GB, Babyn PS, Manson D, Vidarsson L. Pediatric MR cholangiopancreatography: principles, technique, and clinical applications. Radiographics. 2008 Nov-Dec. 28(7):1951-62. [Medline]. Weber C, Kuhlencordt R, Grotelueschen R, Wedegaertner U, Ang TL, Adam G, et al. Magnetic resonance cholangiopancreatography in the diagnosis of primary sclerosing cholangitis. Endoscopy. 2008 Sep. 40(9):739-45. [Medline]. Brine DR, Soulen RL. Pancreaticobiliary carcinoma associated with a large choledochal cyst: role of MRI and MR cholangiopancreatography in diagnosis and preoperative assessment. Abdom Imaging. 1999 May-Jun. 24(3):292-4. [Medline]. Carr-Locke DL, Conn MI, Faigel DO, et al. 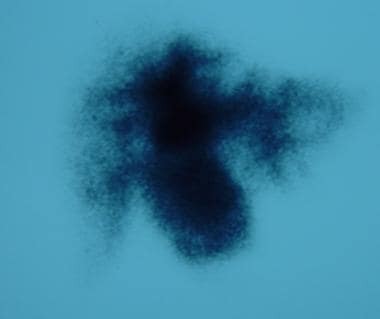 Technology status evaluation: magnetic resonance cholangiopancreatography: November 1998. From the ASGE. American Society for Gastrointestinal Endoscopy. Gastrointest Endosc. 1999 Jun. 49(6):858-61. [Medline]. Dinsmore JE, Murphy JJ, Jamieson D. Pediatric surgical images: MRCP evaluation of choledochal cysts. J Pediatr Surg. 2001 May. 36(5):829-30. [Medline]. Hussain SZ, Bloom DA, Tolia V. Caroli's disease diagnosed in a child by MRCP. Clin Imaging. 2000 Sep-Oct. 24(5):289-91. [Medline]. Norton KI, Glass RB, Kogan D, et al. MR cholangiography in the evaluation of neonatal cholestasis: initial results. Radiology. 2002 Mar. 222(3):687-91. [Medline]. [Full Text]. Shimizu T, Suzuki R, Yamashiro Y, et al. Magnetic resonance cholangiopancreatography in assessing the cause of acute pancreatitis in children. Pancreas. 2001 Mar. 22(2):196-9. [Medline]. Vingan HL. Magnetic resonance cholangiopancreatography versus ERCP: the "superbowl" of pancreaticobiliary imaging. Am J Gastroenterol. 1997 Aug. 92(8):1396-8. [Medline]. Irie H, Honda H, Jimi M, et al. Value of MR cholangiopancreatography in evaluating choledochal cysts. AJR Am J Roentgenol. 1998 Nov. 171(5):1381-5. [Medline]. Kim SH, Lim JH, Yoon HK, et al. Choledochal cyst: comparison of MR and conventional cholangiography. Clin Radiol. 2000 May. 55(5):378-83. [Medline]. Lobeck IN, Dupree P, Falcone RA Jr, Lin TK, Trout AT, Nathan JD, et al. The presentation and management of choledochocele (type III choledochal cyst): A 40-year systematic review of the literature. J Pediatr Surg. 2017 Apr. 52 (4):644-649. [Medline]. [Full Text]. Jensen KK, Sohaey R. Antenatal sonographic diagnosis of choledochal cyst: Case report and imaging review. J Clin Ultrasound. 2014 Dec 13. [Medline]. Oduyebo I, Law JK, Zaheer A, Weiss MJ, Wolfgang C, Lennon AM. Choledochal or pancreatic cyst? Role of endoscopic ultrasound as an adjunct for diagnosis: a case series. Surg Endosc. 2014 Dec 10. [Medline]. Chen J, Tang Y, Wang Z, Wang Q, Wang D. Clinical value of ultrasound in diagnosing pediatric choledochal cyst perforation. AJR Am J Roentgenol. 2015 Mar. 204 (3):630-5. [Medline]. Stringer MD, Dhawan A, Davenport M, et al. Choledochal cysts: lessons from a 20 year experience. Arch Dis Child. 1995 Dec. 73(6):528-31. [Medline]. Rha SY, Stovroff MC, Glick PL, et al. Choledochal cysts: a ten year experience. Am Surg. 1996 Jan. 62(1):30-4. [Medline]. Sato M, Ishida H, Konno K, et al. Choledochal cyst due to anomalous pancreatobiliary junction in the adult: sonographic findings. Abdom Imaging. 2001 Jul-Aug. 26(4):395-400. [Medline]. Kao PF, Huang MJ, Tzen KY, et al. The clinical significance of gall-bladder non-visualization in cholescintigraphy of patients with choledochal cysts. Eur J Nucl Med. 1996 Nov. 23(11):1468-72. [Medline]. Spottswood SE, Jolles PR, Haynes JH, et al. Choledochal cyst with biliary atresia: scintigraphy and correlative imaging. Clin Nucl Med. 2001 Jun. 26(6):555-6. [Medline]. Operative cholangiogram delineating choledochal cyst and pertinent associated biliary anatomy. The authors and editors of eMedicine gratefully acknowledge the contributions of previous author Thomas F Murphy, MD, to the development and writing of this article.